Anyone who wants a real good and complete explanation and help in this area needs to read Christine’s books. I have read everything there is out there, and spent literally 1000’s on books and in her second book “When Shame Begets Shame” I learned more than I had learned in many books written by many top people. If you feel in anyway that this material will help you read them both. The second that I just mentioned, is one of the most complete there is. This is very enlightening a very good read. You changed my life with this book! I awoke to the knowledge I was being abused and equipped me on how to deal with! I tell everyone about it! I will never tire of listening to this. It made more sense than I’d heard in a long time – once you understand what is meant by the term “co-narcissist”. The author explains narcissism very clearly. I found it useful to understand it’s very broad spectrum and how to identify the characteristics of this type of behaviour. 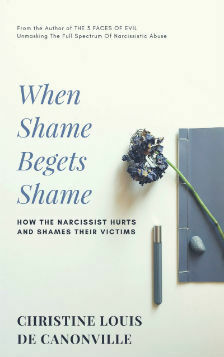 I look forward to the author’s next book, which hopefully will help people who have been involved with narcissists how to recover healthily from relationships with such people. Christine’s book sets out in very clear language how to recognise Narcissistic behaviour, regardless of where you may meet it. I expect that any reader who suspects they may be a victim of Narcissistic abuse will have an AHA moment when they check through the nine diagnostic criteria for identifying NPD. I had, and now know what I am dealing with, which, while daunting is also a relief! A must for anyone trying to heal from narcissistic abuse. Informative and written in clear language that the layperson can understand. Also, helps understand the dynamics of narcissism and how to avoid falling into the trap again. Highly recommended. of narcissistic behaviour by people, who display this unfortunate personality disorder. It explains how to recognise the signs and how to protect yourself from their destructive behaviour. These individuals are very much “wolves in sheep’s clothing” and can be very charming and plausible. It seems that if you get on the wrong side of these people and thwart their desires, they can turn on you and be very damaging to your emotional well-being in the milder cases, and even physically dangerous in the extreme psychopathic end of the spectrum. Fortunately, I have only met people at the milder end of the spectrum and have always wondered where our friendship has gone wrong, only to realise that our relationship was doomed from the start. Unless, you are prepared to flatter them constantly and agree to their unreasonable demands, you really have to walk away from them with your well-being intact. A very helpful guide from someone, who has had personal experience and has studied the condition from the perspective of a professional psychotherapist, and is an expert in this field. “Although not a therapist, I felt extremely privileged to have been able to attend your workshop “Understanding the Web of Deception”. The Educational information in both your book and workshops is relatively new to me, and is of the most importance for me, to learn about the different personality types. “This morning I having been reading the workshop manual. You make it so beautifully clear and easy to understand. This finally explains so many things for me which I have struggled to comprehend. Having engaged in my own therapy several times and then been still seemingly unable to positively affect certain important relationships in my life, this finally helps me to understand what I was likely up against. I regret that I had to experience so many losses before I found this information and understanding, but I am still here, and this gives me the best chance ever to be safer and happier in the rest of my life. My experiences also give me a clearer and deeper purpose to be there for others once I am satisfied with me own healing – I’m just about there I think. Strangely enough, I felt quite grateful for the Storm disruption. It enabled me to notice how far I have come in the journey back to my old resilient self. A year ago making this trip alone would have been unthinkable for me and I feel so relieved to have my old “self” back, perhaps even a little stronger and wiser (I hope).